OFFICIAL BOOK BLURB: Plagued by overpopulation, disease, and starvation, humanity was headed for extinction—until an alien race called the haan arrived. And then the real trouble began. FORMAT/INFO: The Burn Zone is 374 pages long, divided over thirty-one numbered chapters. There is also an acknowledgements page. Narration is in the first-person with Sam Shao as the sole narrative voice. February 5, 2013 marked the paperback and e-book publication of The Burn Zone via Ace-Roc books. The cover art is provided by Dave Seeley. ANALYSIS: The Burn Zone is a book that managed to register itself on my radar due to its intriguing blurb details. I earlier didn’t know that this book was by the same person who had previously written the Revivors trilogy. I had read the first book and while I wasn’t able to review it, I was impressed by the author’s imagination and story settings. The Burn Zone begins on an alternate Earth, which is remarkably similar to ours and is set in the near future wherein an alien race has crashed into a facsimile of the nation of China. These aliens called the Haan have take refuge among the local population and the government has helped them with it. The addendum being that the Haan help them with their nation’s security and weapons technology. The Earth’s population has grown beyond what can be sustained and so now massive amounts of the population face hunger pangs and have to make do with food being used as currency. The Haan add to this issue by demanding massive amounts of food for themselves and they justify their food needs by providing this alternate Chinese nation with futuristic technology that has propelled them ahead of the other worldly nations. This action has a dual effect of making this nation the most strongest in terms of technology and military might and the most detested by the rest of the world as well. With this background, we are introduced to the main character of Sam Shao who is a surrogate mother to a Haan infant she has named Tanchi. She is leading a content life (of sorts) waiting for her godfather Dragan to return to Hangfei from his current assignment on the border towards the Pan-Slav Emirates. She is shocked when Dragan returns unexpectedly and with dire news. The state police who have quite a few charges of grave magnitude against him follow him and the end result is a scuffle that causes even more hassles for Sam, Dragan and the future of Hangfei. Thus begins the first volume in the Burn Zone series by James Decker. Here’s what impressed me about this book, at its heart this book is a thriller through and through. It comes in the wrappings of SF and Alternate history however the storyline follows the tenets of a thriller. The author has carefully developed his premise of Aliens who have crash-landed and are in a situation similar to the one showcased in District 9. Albeit their situation and the world settings are very much different than those of the extra-terrestrial creatures in the film. This world is carefully peeled over the course of the story and for some this might be a make-or-break factor in their enjoyment of the storyline. I thought the author has done some excellent world-building in presenting a world that is beset by hunger issues and then nicely showcased the possible scenarios in which the human society might have adapted to such harsh conditions. I enjoyed reading about the various criminal or seedy activities that were shown in this book in relation to the demands of the society and this evolution felt very realistic. There are some negative factors to this new series as well, beginning with the pace of the storyline, it is very tepid in the first 80—100 pages as the author introduces the world, the main character and her surroundings. While I understand the author was laying the setup for the book and this series, as a reader I had to really plow through these pages to get to the real meat of the story and so I would like to warn new readers of the same. Secondly with this being a first person narrated story, it is very important that the main protagonist be an intriguing one and in this regards, the story suffers as Sam Shao isn’t that attention grabbing. Of course we do learn about her back-story and are towards the later third of the novel, she does come into her own. However as main characters go, she wasn’t the strongest one I have read about. Thirdly and lastly this is a per peeve of mine, but in SF and Alternate-historical stories, I always like to have a map to see how the story in developed in terms of geography and with the story moving around and with all the places and nations mentioned. I thought the presence of a map and glossary would have helped deepen our understanding of the world presented within. CONCLUSION: James K. Decker is definitely an author with some cool tricks up to his sleeve, he obviously couldn’t show all of them in this book but the potential is seen and I for one will definitely be reading the sequel to see how he further develops the story and the world. 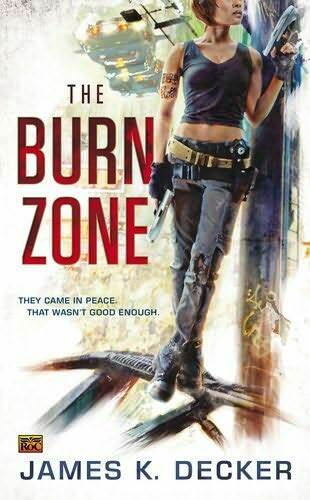 Give The Burn Zone a try if you want to see a hybrid SF-Thriller, with a well-developed world and massive conflicts looming. The Burn Zone is a surprisingly interesting read and will definitely find its fans.